9610 Rocky Lake Sun Lakes AZ is located in gated Oakwood Country Club and is a 1675 square foot villa. The home has two bedrooms, two baths and is virtually maintenance free living. Sun Lakes, Arizona is an active adult community in the Southeast valley of Phoenix bordering Chandler. 9610 Rocky Lake is in gated Oakwood Country Club, the newest of the Robson developed communities. Sun Lakes is conveniently located to all major freeways including the I-10, the 101 and the 202 and only a half hour from Sky Harbor International and Mesa Gateway Regional Airports. One of the best parts of owning a villa is that your homeowner association fee covers all exterior maintenance including roof repair and painting as well as all landscaping. Whether you are a year round resident or a snowbird this home will allow you to move in an enjoy all the resort amenities without worrying about exterior maintenance. And, when you are ready to leave just lock up and go and someone else will cover the outside. Great curb appeal is the first thing you notice when you arrive at this home. The security decorative door is inviting and welcoming. As you enter the family room, dining room, kitchen and master bath are to the left. The guest bedroom, sitting area or office, guest bath and laundry area to the right. The split floor plan is perfect for guests, giving quiet and privacy. The flooring is neutral tile and carpet. You will love the lighting in this home with large picture windows throughout and the window over the kitchen sink looking over a greenbelt. The kitchen is spacious with an island, breakfast nook, pantry and access via sliders to the patio. The master suite includes access to the patio and has dual vanities, a separate toilet room, shower and walk in closet. Take a look at our listing video below. When you buy a home in Sun Lakes you are buying a lifestyle. How about 27 holes of golf, 14 tennis and pickle ball courts, swimming pools, lap pool, fitness center, lakes, walking paths, restaurants, billiards and so much more. If you like playing cards there are groups for Bridge, Mahjong and Bunco. Join in a hiking or biking club or take an art class. Sun Lakes Community Theater is always looking for volunteers with theatrical talent. There is something for everyone in Sun Lakes, Arizona or just kick back and relax at the pool or take a walk through the neighborhood. People are friendly and welcoming in this community. If this lifestyle sounds intriguing watch our active adult community lifestyle video below. Just outside the gates of Oakwood Country Club is shopping, grocery stores, gas stations, pharmacies, office buildings and within a fifteen minute ride you are at Costco and Chandler Fashion Mall. 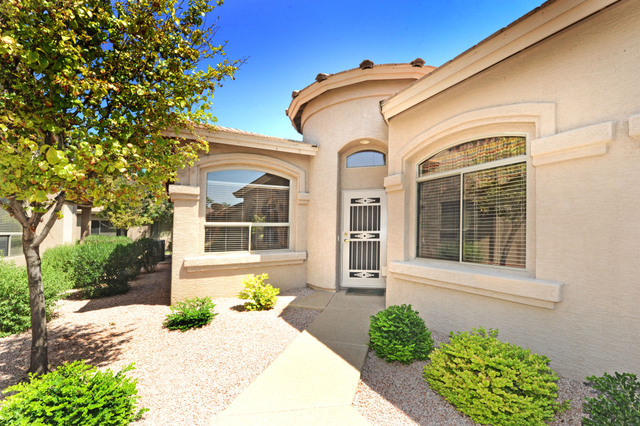 Chandler is full of local and chain restaurants, theater, museums and medical facilities. Location is one of the top reasons people choose Sun Lakes Arizona as their retirement community. Give us a call at 480-440-0849 for more information on this home or any home in Sun Lakes, Arizona. Or, fill out this quick form below and we will contact you to help you learn more about living in a community that is like being on vacation every day!